I’ve listened to so many experts this year talk about the importance of creativity and authenticity. And I’ve spent a lot of time thinking about it. How does one cultivate more creativity and authenticity in their life, work, and art? And it’s after this time of thinking about creativity that’s caused me to realize that becoming authentic is a process. 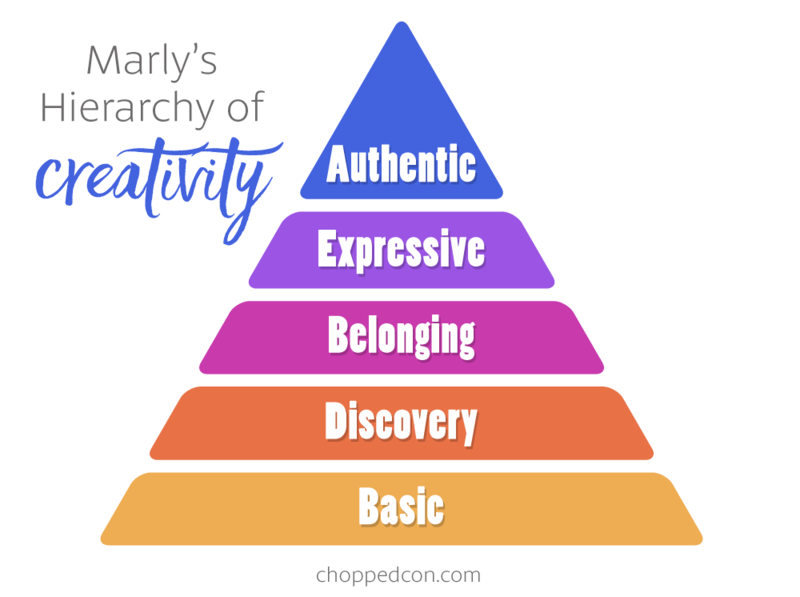 That’s the impetus behind today’s post — Marly’s Hierarchy of Creativity. Did you study Maslow’s Hierarchy of Needs in college? Me too. And it was in listening to people talk about creativity and authenticity that caused me to contemplate that original pyramid based on human needs and to consider a hierarchy of creativity. It’s a way of thinking about creativity from a process perspective. My musings began a few years ago when I quit my job and started doing freelance work on my own. That was a brave move, but necessary. My former place of employment had turned into a toxic, Dilbertesque workplace. Toxic work environments are like smoky bars. Every day when you leave, you’re covered in a stinky, filthy cloud of negativity. It’s not healthy. Toxic work environments are like smoky bars. Every day when you leave, you’re covered in a stinky, filthy cloud of negativity. I thought working for myself would free me of all that toxicity, but what I soon learned is that if you don’t take action to exorcize the negativity from your previous work environment, it WILL follow you. Jeff Goines talks about this concept in his book The Art of Work. He explains how it’s possible to abandon the status quo and live a life that matters with true passion and purpose. However, he also points out that if you’re not careful, you can begin creating similar work-life balance and toxic environment issues in your passion work. For example, think about the internal dialog that goes on in your own head. Sometimes that can be just as bad (or worse) than any previous colleague you’ve worked with! So, because I didn’t listen to Goines’ advice and I skipped that step of cleansing myself from the previous, no-good work environments, I found myself in some pretty toxic partnerships after quitting my corporate job. Big surprise. Here’s one thing I know: all of these experiences (toxic work environment included) were helpful to me in in one way or another. Now I’ve learned How Not to Be a Doormat. And that’s the first step in building a more creative, authentic life. Because at the very base of the hierarchy of needs, is the same as the hierarchy of creativity, the need for safety. From there you work your way to becoming a truly authentic creative. Here are the steps I’ve outlined in becoming an Authentic Creative. At the foundation of Maslow’s Hierarchy of Needs (MHN) you will discover the word physiological. It’s the basic needs a human requires to survive. It makes sense, we are physical beings. The human body cannot function without basic physical needs such as food, water, and air. We can also include in this level clothing, shelter, and connection with others. I believe the same is true for our creative beings. 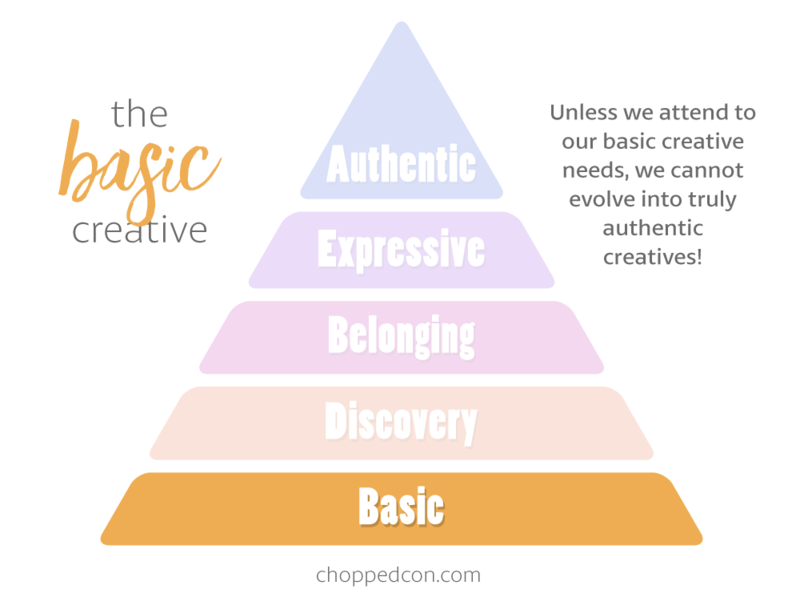 Unless we attend to our basic creative needs, we cannot become truly authentic creatives. Let’s imagine a person who has an idea. Let’s call her Daria. So, Daria saw a popular food blog or e-book or online course of some kind, and it sparked a passion in her. Daria has a job, but it’s just that…a job. There are some days she hates her job and other days when it’s not so bad. But when Daria saw that popular blog on Facebook with the pretty pictures, she thought to herself, I want to do that. So she went to that blog (and others) and looked through all the pretty pages and dreamed of some day starting her own blog. At this very basic stage of being creative, Daria, doesn’t have a lot of her own ideas. She’s mostly voyeuristic and dreaming. She imagines herself what she’s seeing others doing. She may even start to think of names for her site or what kind of recipes she’d like to share. There’s a lot of romance at this stage, because there’s no reality to compare it to, so Daria is mostly thinking about the exciting possibilities, and not realizing the work that’s involved. Basic Action Steps: There’s not much visible action occurring at this stage, but a lot of dreaming and desiring. But that doesn’t mean this isn’t an important step. In fact, without it, you could never move to the next step, Discovery. Maslow’s next step is to say that once a person’s physical needs are met, then they can move on to safety focused issues. Safety for a creative can mean something entirely different. For someone who is dreaming of a more creative life, but still not secure in their own creativity, copying other creatives is their first, real step. This is a person who has an idea and is starting to take action on it. Our fictional character, Daria, had an idea that came upon her like a spark in the Basic Creative Level. But now after some daydreaming and visioning, Daria is ready to take action. She works full-time at a job she doesn’t really like, and this limits her time. Daria doesn’t even have any training at being a creative, so she takes the leap belly first and the only thing she knows to do is to try and copy the sites she loves. We love to put down creatives at this level. We even call them names like copycats. This begins on the playground. It’s as if we’re programmed early on to shame them. But, in reality, they’re doing something that is not only understandable, it’s a pretty good idea. It’s that whole not reinventing the wheel thing. Or maybe it’s that whole learn to walk before you run thing. So many worn out metaphors! But the point remains, being a self-actualized creative is not easy. We’re all socialized from early on to fit into the pack. Being truly creative requires us to shed that herd mentality and follow our bliss. And if you’ve been a people pleaser your whole life, you’ll have no idea even what your bliss is. That’s why seeing things you like being done by others is oftentimes the first step in becoming creative yourself. However, let me give a word of caution. Copying others for your own practice is one thing. I listened to Terry Gross of Fresh Air interview a novelist who said he learned to write by typing the work of other novelists. He felt that helped him really get into the mind of the writer and understand the flow of the novels they wrote. He typed up a lot of books. However, he didn’t publish them. And that’s the only point I want to make here. Copying someone else’s work for your own creative process is one thing. In fact, Matt Armendariz encourages food photographers to find a favorite food photo and to do their best to copy it. It’s a part of learning to play with creativity. What you want to be careful not to do is to copy too liberally and then publish it as your own. If you do choose to publish work that you feel is inspired by the work of others, give them credit. Put a link in your post acknowledging your favorite photographer/blogger/creative. Musicians provide a great example here. A band may cover (copy) a Beatle’s song. And they acknowledge it. Although the Beatles’ songs are so ubiquitous now, sometimes that’s not even necessary. Everyone knows the band is doing a cover song when they’re playing “Let it Be.” But if they’re playing Nancy Wilson’s song Rainbow, they will probably acknowledge it to the audience. So, copying is a big part of an artist’s safety at this point in the game. Don’t beat yourself up if you find yourself without as many creative ideas of your own. Spend time understanding what inspires you and find safe ways to copy those ideas, and add some twists and turns of your own. By the way, if you need some copying inspiration: Dvorak created some classical masterpieces. One of my favorites is Symphony No. 9 in E Minor. I can listen to it on repeat all day. I kid you not. And if you listen closely, you’ll hear little snippets of tunes he stole from the American South. Interestingly enough, he composed this piece (and others) after his visit to the Americas. In fact, borrowing tunes from folk songs was not an uncommon thing for many of the classical composers. It makes sense. Those were tunes loved by thousands and it gave their pieces more instant gratification from the masses. Discovery Action: Things are starting to happen here. You may have actually purchased a domain name and started planning out some posts. You may even have your basic site setup and started sharing it with friends and family. This is an exciting step and it’s easy to find yourself beginning to feel overwhelmed. That’s why the next step is an important one, networking with others doing similar work so you can create a sense of belonging! Maslow shows how the next step in MHN is to feel loved and a sense of belonging. Friendship, intimacy, and family are important social needs. We are social beings. It’s no different for creatives. This is the place where creatives begin building their tribe. Members of their tribe may include other creatives, family, friends, coaches, and even an audience. People at this level may still find themselves copying others, but not quite as much as before. They’re starting to create their own style, and beginning to make a name for themselves as a result. Connecting with like-minded creatives is an important step at this stage! This is a person who has an idea, has begun acting on it, and is now reaching out to others and beginning to feel part of a community. Daria saw a food blogger, felt the spark of creativity within herself, and now she’s taken action and actually started her own blog. Sure, she’s doing a lot of recipes she’s seen on other sites (with her own spin), but she’s starting to exercise her creative muscles. And now she’s reaching out to others within the food blogging community, particularly those on Facebook. And she’s starting to feel part of a community. She’s probably even thinking about attending a food blogging conference, liked Chopped Conference. It’s smart to choose a smaller, more intimate conference rather than one of the bigger ones, especially if it’s your first time attending a food blogging conference. I’ve talked about ways to get the most out of a food blogging conference before. Attending a conference is another important sign, it means you’re willing to invest money into the work you’re doing. It means that blog you started as a hobby, is making its initial steps toward turning pro. Belonging Action: There’s a lot happening at this level. You’re reaching out to others, whether commenting on their sites, joining in private FaceBook groups, or seeking out and attending conferences. 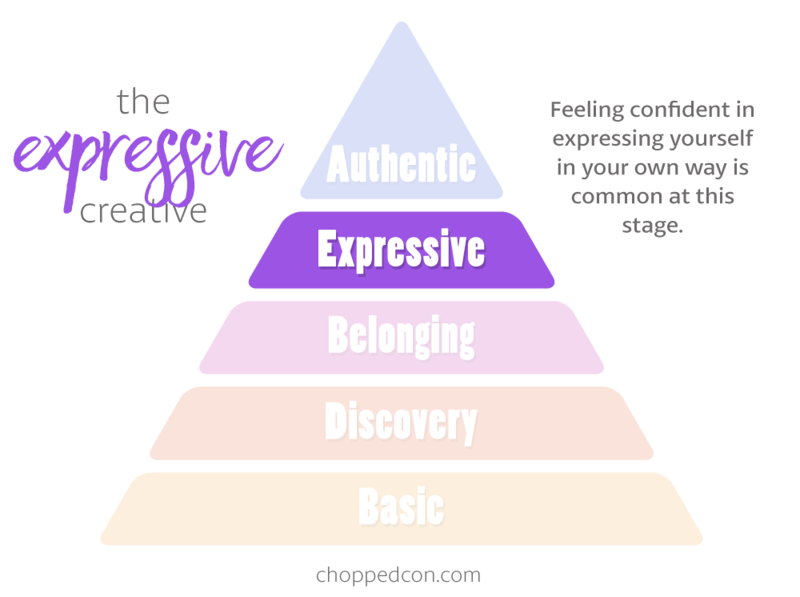 In fact, this step helps you start to feel more confident and you’re now ready for the Expressive Level of creativity. Maslow calls the next level Esteem. It’s true that self esteem is an important part of this process, because it builds on a person’s self confidence. Given that, self expression is a natural outflow of this step. The Creative at this level will understand and appreciate the creativity of others, but will not feel the need to be like them. You’re now more confident in your own style. You’re beginning to know what you do and don’t like. Correspondingly, you are also developing your own sense of personal style. You may choose to cut your hair differently. Your fashion tastes my change. How you spend your free time may change as well. You’re more confident sharing your views, because you see them as that – your own views. This is a person who had an idea, acted on it, reached out and began participating in a community, and is now developing the confidence to find their own ways of expressing themselves. It’s an exciting step. Our example blogger is Daria. She began by simply feeling inspired when seeing other bloggers on Facebook. She didn’t really like her job all that much so she decided to start her own blog in her spare time. Her first posts were not that great, but she used other successful bloggers as a template. She honestly didn’t even know much about what she was doing, but she kept at it and even joined a few blogger groups on Facebook where she began to make friends. 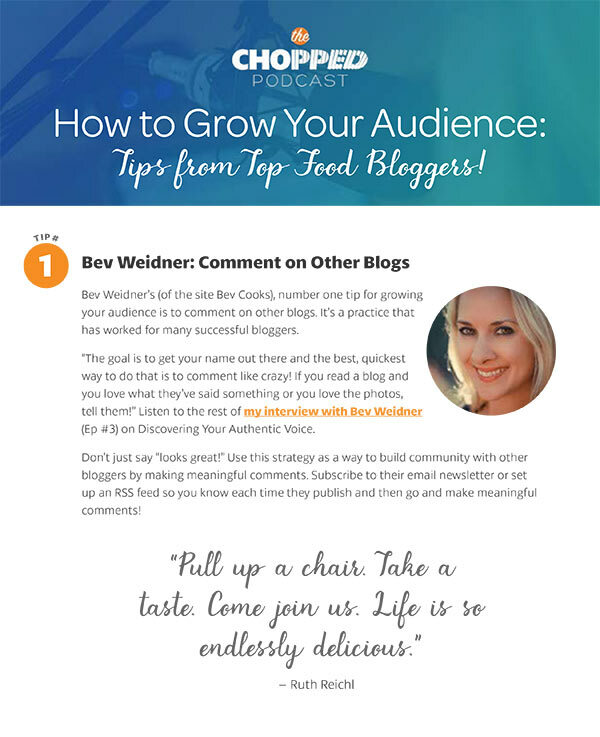 Eventually she attended a food blogging conference and began connecting in a huge way with others. Now, she’s starting to stretch her legs a little. She’s developing her own voice in her writing. She’s even taken a cooking class so she can feel more confident in her recipe development. Feeling confident in expressing yourself in your own way is common at this stage. Expressive Action. There’s a lot of change at this level, from the way you express yourself with confidence to even your personal style. Your audience may be growing as a result too. People are drawn to others who are confident in themselves so be prepared for that. You’ve grown from wanting to being. 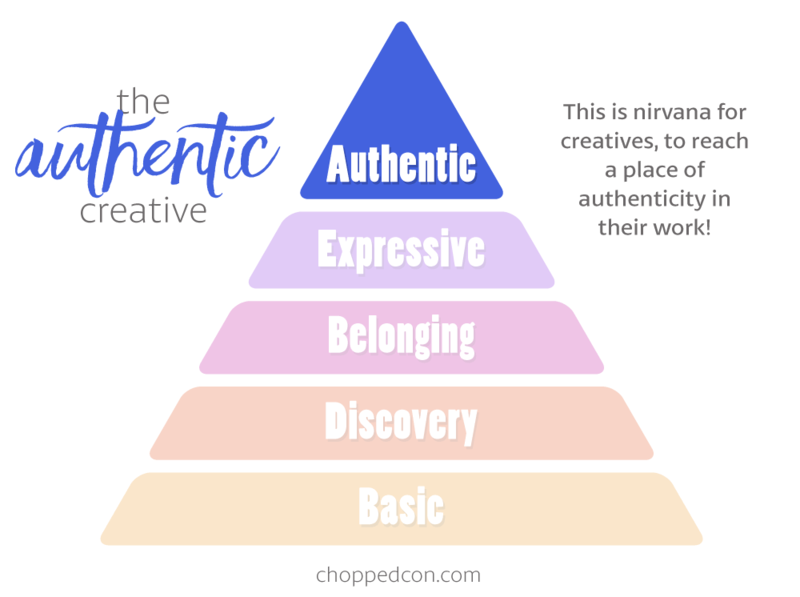 You’re on the cusp of the nirvana of creativity, becoming authentic. Note: Be sure to carry a notebook or have some way of jotting down all the creative ideas that come to mind! Maslow calls this level self-actualized. I love that term, but we all have to agree that being authentic is the pinnacle for Creatives. It’s important to clarify that being authentic and being original are not the same thing. Being authentic is following your own path. It’s truly challenging to be an original in today’s world. In fact, the pursuit of originality can be the kryptonite of the creative. It’s much better to pursue authenticity. Authentics are one-of-a-kind. You’ll know when you meet them. They’re willing to talk about their colored hair, or large noses, or love of a band that is totally not cool. (Can you say Bee Gees?) They are not apologetic for their style of expression, or maybe they are, but it’s in a totally I’m sorry, but I’m not way. This is a person who had an idea, began acting upon it, had no idea what they were doing at the beginning so copied a lot of other people (with credit), kept learning, worked hard, joined some food blogging groups, went to conferences, began feeling comfortable with her own voice, and eventually reached authenticity. She has her own style now and loves it. This is nirvana for creatives, to reach a place of authenticity in their work! Interestingly enough, there are some newbies copying Daria’s style now. That’s just how it works. The first real of authenticity is, don’t talk about authenticity. One thing I’ve learned through my journey about authenticity is that it can be kind of elusive. For one thing, it’s easy to think that you have to be 100% authentic 100% of the time. That’s an interesting topic and one that requires a little thought. Are you only authentic when you’re swearing? And if so, are you going to swear in front of your conservative, but loving grandma? Just because you tone your authenticity down in certain circles doesn’t mean you’re any less of who you are. Think of authenticity as a Venn Diagram. In one circle, there’s the private authentic you. In the other circle, there’s the public version of you. The more those two circles can overlap, the better. Just know that it’s probably not going to be a 100% overlap. At least not for most of us. We’re all on this learning curve together — how we can be creative entrepreneurs. As life coach and author Jay Pryor says, “A happy, powerful life is a journey, not a destination.” We’re all making this stuff up as we go along and so finding ways to live in your own integrity and enjoy the journey toward being more authentic is crucial. Also, it’s important to note that a person may find themselves meandering back and forth between levels. Life circumstances can sometimes be the cause of this. Taking a step back to a different level can also result from a blow to our confidence. The key is to know where you are in the process and find ways to take baby steps toward authenticity. 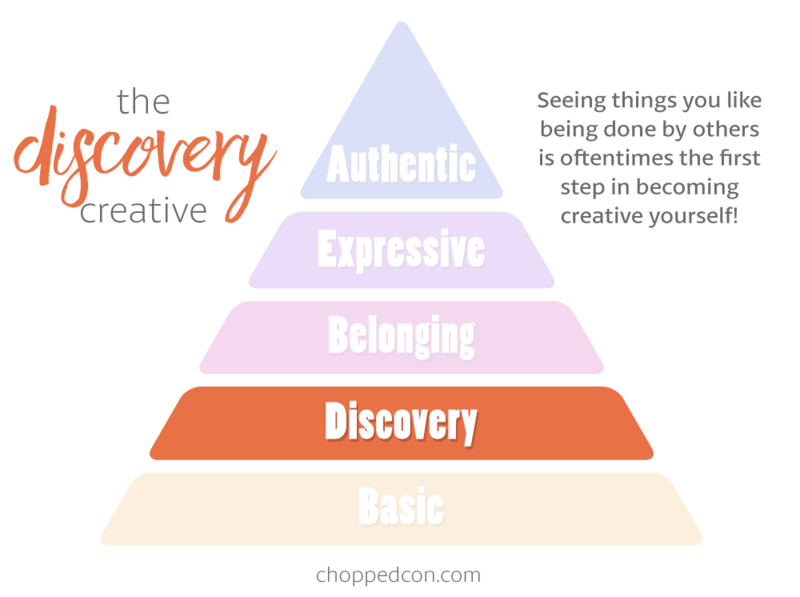 Use Marly’s Hierarchy of Creativity as a guide to understand where you are on the creative process and to find ways to move forward to higher levels of creativity.